Resource center A Look at Drug Abuse. Common Signs and Symptoms What Is the Purpose of a Placebo Pill? Psychologists and doctors often talk about the placebo effect. This is the term for a psychological benefit incurred by any treatment that is not really a treatment – usually in the form of fake pills with no active ingredients. The person receiving the placebo may or may not know that the pills are fake, but amazingly, some studies show that this does not matter. In some instances, a person can know a treatment is not real and still experience positive outcomes. A placebo is most commonly used in clinical trials to determine the actual effectiveness of a new medication. For example, a new treatment for blood pressure will be given to some people participating in a trial while others will receive a placebo. None of the patients in the trial will know whether or not they are receiving the new medication or a placebo pill. Researchers will measure improvements, both self-reported and changes to physical health. This helps them determine whether the new medication is effective or if it only incurs a psychological benefit. The self-reported benefits of placebos occur because people want help. When a person believes they are receiving help, they will feel better, regardless of what a medication does for them. If a person expects results from the treatment, some results will occur, including changes in blood pressure, breathing rates, and mental health. Placebos can also induce negative side effects if the person believes these will occur. For example, if the patient expects to feel nausea, headaches, or fatigue, they will report these side effects. The medical encounter: A positive interaction between a doctor and patient eases a lot of anxiety, and it can induce some placebo effect. Regardless of what the doctor chooses as the treatment, their patient will receive some positive benefits because of their beliefs about good treatment. Upbeat diagnosis: When a doctor provides a sense of positivity with the prognosis, as much as they are able to, their patient will be more likely to feel better about prescribed treatments. Expectations of treatment: A doctor can influence their patient’s beliefs about treatment choices using subtle physical or verbal cues. Conditioning: Treatments known to be effective, or consistently advertised as effective, will be believed to be more effective. When these treatments are prescribed, the person may experience more positive benefits because they believe the popular treatment will work for them too. Brain chemistry changes: Emotional reactions to treatment change brain chemistry by releasing endorphins or by changing the balance of neurotransmitters like dopamine or serotonin. These are changes that medical treatments are also designed to induce, especially drugs like painkillers or psychiatric medications. Typically, placebo pills are not used during rehabilitation or recovery. People who need to stop abusing substances also need to develop habits that take them away from relying on a drug to feel better. Some people genuinely need help in the form of medically managed detox, using buprenorphine or a tapering regimen to end the body’s dependence on drugs like opioids or alcohol. These forms of therapy are important in easing withdrawal symptoms, which can be very uncomfortable and lead to relapse without appropriate help. However, it is possible for placebo pills to incur some benefits in addiction treatment. This is because medications have associated expectations, and a person may experience some benefits during their treatment if they expect they will feel positive outcomes. 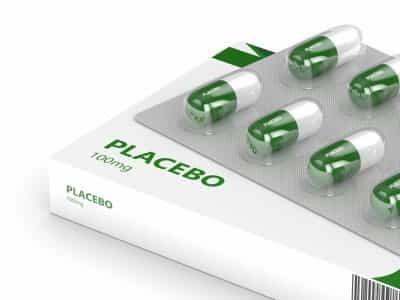 Generally, people with serious conditions receive more benefits from medical and therapeutic treatment compared to placebos; however, placebo treatments still have surprising positive outcomes for around one-third of people in studies who receive them. For example, a study involving people with anxiety, 60-70 percent of participants who received either clonazepam, a benzodiazepine, or an SSRI antidepressant were panic-free within 10 weeks. However, an administered placebo incurred similar benefits for 30-40 percent of study participants. While this rate is much lower than the rate associated with the appropriate medical treatment, it is still a significant number. In 2008, a study published in the Journal of Studies on Alcohol and Drugs examined placebos used in treating alcohol use disorder. There were 1,383 participants, all with alcohol dependency. The group was divided into three treatments: specialized behavioral therapy, the same therapy with medical management, and therapy with both medical management and a placebo treatment. Throughout 16 weeks of treatment, those receiving only behavioral therapy had fewer days abstinent from alcohol compared to the other two groups. With medication, the placebo group remained abstinent for more days compared to the group receiving behavioral therapy and medication management. This seems to suggest a place for placebo therapies in addiction treatment. Placebo treatments could be especially beneficial for people struggling with prescription drug abuse, including narcotics addiction. While treating chronic pain or injury-related pain is very important, prescribing practices associated with opioid painkillers are believed to have created the epidemic of narcotics addiction in the United States. Doctors are now seeking other ways to treat pain, and the placebo effect may be beneficial for some people who are prone to addiction or substance abuse. Studies have found that taking a placebo pain medication releases endorphins, which can dampen pain signals in the brain and spinal cord. Prescription narcotics also affect the release of endorphins, but medical investigation suggests that much of the benefit, including the immediate benefits, involve the patients’ expectation that the prescription will treat their pain. Although they have not been used, it may be possible to use placebos to ease withdrawal symptoms or work on a “taper” during some kinds of detox. While some substances, like alcohol or benzodiazepines, can cause life-threatening problems like seizures during withdrawal, other types of withdrawal are uncomfortable but not dangerous. Offering a treatment that eases symptoms without introducing addictive substances could be beneficial to people who need help with recovery. Additionally, doctors with patients who have a past history of substance abuse may choose placebo treatments for specific complaints, such as sleep disorders or anxiety. This helps to reduce the potential of intoxication from drugs while also attempting to treat the individual. The placebo effect is very powerful and may be applied in the future in addiction treatment. Right now, doctors and lawmakers are discussing ethics around informing patients about placebo treatments, and many believe that it is vitally important that patients know what treatment they are receiving. This means that people entering rehabilitation must be informed that they are receiving a placebo medication or therapy. It is hard to know how this will affect substance abuse treatment, so it is important to focus on treatments known to work: medically supervised detox; therapy to change behaviors, including both group and individual therapy; and abstinence from intoxicating substances.